Production modeling was once only used by plant-level operations engineers to help utilize capacity or schedule production. Today, many of the world's leading companies have found that modeling production footprint, operations and capacity as part of their end-to-end supply chain practice can be the key to outperforming the competition. And that extends far beyond the four walls. Recent advances in supply chain design technology have opened the door to a new era of extremely valuable enterprise-scale optimization. Companies can now manipulate large amounts of data to model, analyze and optimize their end-to-end supply chain operations, from large-scale network optimization all the way to SKU-level inventory optimization and transportation analysis. As part of this continuous supply chain design process, production modeling can be used to identify major improvements in cost, service and risk mitigation. 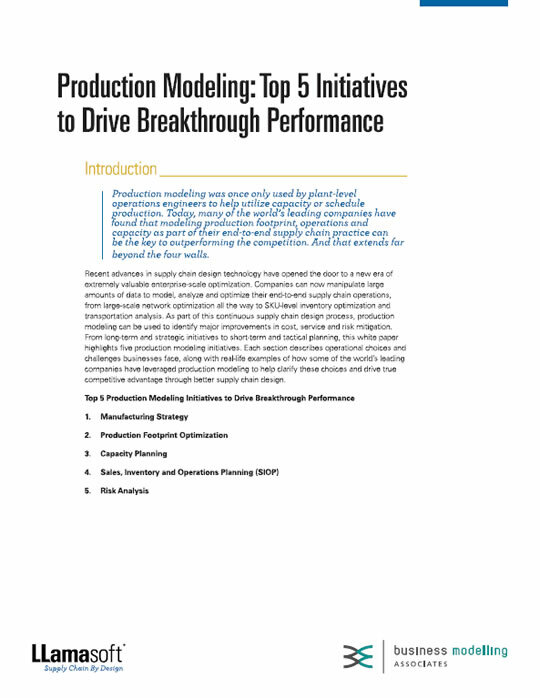 From long-term and strategic initiatives to short-term and tactical planning, this white paper highlights five production modeling initiatives. Each section describes operational choices and challenges businesses face, along with real-life examples of how some of the world’s leading companies have leveraged production modeling to help clarify these choices and drive true competitive advantage through better supply chain design.